Shipwreck salvage company Gold Hound LLC has found a bronze cannon with 63 gold and silver coins concealed inside, the company said Monday. 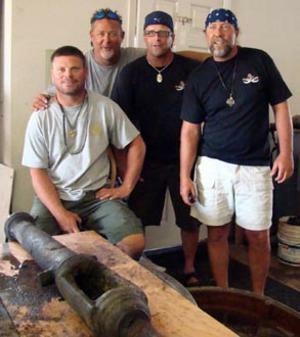 The cannon is part of the 1715 Treasure Fleet that sunk off Sebastian nearly 300 years ago. Inside were 25 colonial Spanish gold coins and 38 silver coins, but 22 more gold coins were found alongside, according to a news release. The bronze swivel cannon was used to fend off pirate enemies on the treasure ships' ill-fated journey back to King Philip V in Spain. The cannon was encrusted from lying hidden in the depths for centuries, and during its conservation, it suddenly let loose its of gold and silver, with an estimated value of more than $500,000, the company said. The cannon was discovered in less than 15 feet of water about 40 miles north of West Palm Beach. Gold Hound is a subcontractor for 1715 Fleet-Queen’s Jewels LLC, which acquired salvage rights to the fleet from the heirs of treasure hunter Mel Fisher. Queens Jewels, also based in Sebastian, was founded by William Brisben, who previously led a national Cincinnati-based real estate development firm before serving seven years as the U.S. representative to UNICEF under President George W. Bush. Among the gold coins was an extremely rare 1698 Cuzco mint coin from a Peruvian mine that operated for just four months, adding to the importance and value of the coin, the news release said. Historians have struggled for decades to unearth more information about the mine, of which little is known. The remaining gold coins appear to be primarily from Bogotá, Colombia, referred to as “Bogie 2s” for their denominations, the news release said. The silver coins, subject to further identification, likely originate from mines in Mexico and Bolivia.